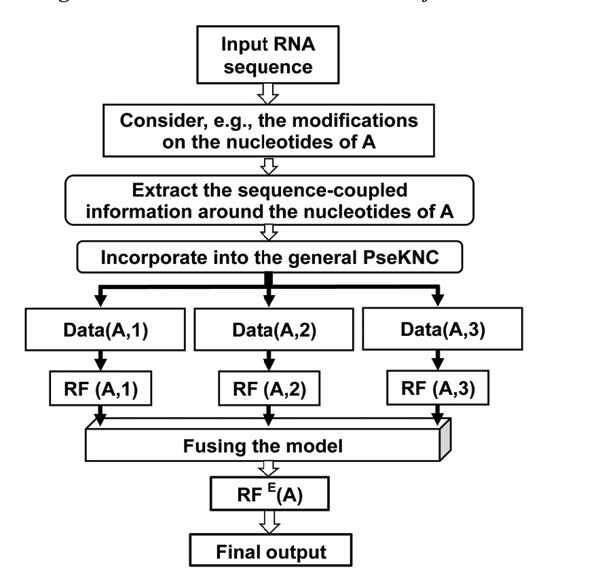 Keywords: 2'-O-Me modification sites, RNA, Sequence-coupled model, Ensemble classifier, Fusion, PseKNC. Keywords:2'-O-Me modification sites, RNA, Sequence-coupled model, Ensemble classifier, Fusion, PseKNC. Abstract:Objective: Being a kind of post-transcriptional modification (PTCM) in RNA, the 2'-Omethylation modification occurs in the processes of life development and disease formation as well. Accordingly, from the angles of both basic research and drug development, we are facing a challenging problem: given an uncharacterized RNA sequence formed by many nucleotides of A (adenine), C (cytosine), G (guanine), and U (uracil), which one can be of 2-O'-methylation modification, and which one cannot? Unfortunately, so far no computational method whatsoever has been developed to address such a problem.